Eclipse Glasses | Custom Made — Rainbow Symphony, Inc. Since Rainbow Symphony was founded by a passionate eclipse chaser, we know all about creating effective and safe eclipse glasses for viewing any solar event. Eclipse glasses are among the coolest giveaway items for companies and institutions promoting themselves, since they’re affordable, useful, and customizable! 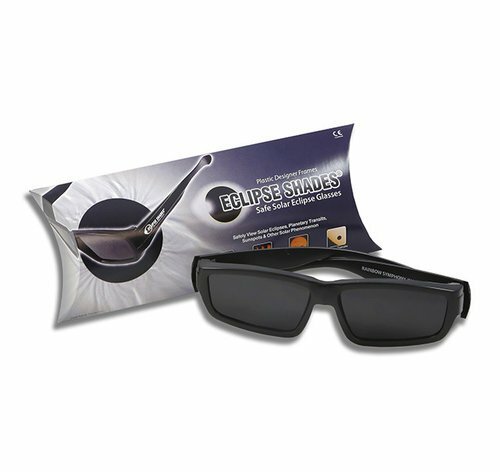 Place an order for these solar glasses before the next eclipse in 2024 and promote your business while helping people discover the magic of the celestial world. Whether you choose our premade designs or create your own for our eclipse glasses, these solar viewers are a great way to promote your business or raise money for charity. Many schools, clubs, museums, and charities have raised money through sales of our eclipse shades. Work with our art department to create glasses that include your company name and info, as well as coupons or promotions, and hand them out at major events to raise awareness of your business. Discover how our glasses can benefit your youth group, service organization, or learning institution when you get in touch with Rainbow Symphony today! These fit over optical glasses! Solar Viewer - Optical Coated Glass Lens - View Solar Eclipses and Sun Spots. - 5.5" X 8.5"
Solar Eclipse Viewer - Safe for Direct Solar Viewing - 3" X 5"
Eclipse Glasses_ Charlie Bates Solar Astronomy Project. Solar Viewer - #14 Welders Glasses Lens - View Solar Eclipses and Sun Spots - 5.5" X 8.5"
Eclipse Filter Material - Solar Viewing Film Sheets. 12" X 12" Sheet. The next total eclipse in America is going to occur this year! On August 21, 2017, get your glasses ready, as this eclipse will make landfall in Oregon and move through the country before exiting off the coast of South Carolina. This will be the first total eclipse in the United States since 1979! For people in South America, Western Europe, and Africa, the eclipse will still be viewable, but it will be a partial eclipse. Explore the NASA Interactive Google Map to discover how close you’ll be to the total eclipse! There will be no visible eclipses in Europe until August 12, 2026. 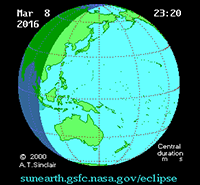 Faeroe Islands and Svalbard - Total Solar Eclipse Friday March 20, 2015 - This will be the last total solar eclipse visible in Europe until the eclipse of August 12, 2026. A total solar eclipse will occur on Friday March 20, 2015. In 2015, in the N. Atlantic, Faeroe Islands and Svalbard, with a maximum duration of totality of 02m47s. Sumatra, Borneo and much of the Pacific Ocean - Total Solar Eclipse March 9th, 2016- If viewed from east of the international date line, for instance from Hawaii, the eclipse will take place on March 8, (local time).This eclipse will be visible in Sumatra, Borneo and much of the Pacific Ocean. This total solar eclipse March 9th, 2016 with duration of 04m09s. It will have a magnitude of 1.0450 that will be visible across an area of Pacific Ocean, beginning at Indonesia, and ending at northern Pacific Ocean. The Great American Eclipse - Total Solar Eclipse August 21, 2017- The Great American Eclipse. A total solar eclipse has not been seen on in the United States since 1979. A Total Solar Eclipse August 21, 2017. Making land fall in Oregon and Exiting the US off the coast of So. Carolina. This eclipse with a duration of 02m40s at 37°38′12′′N 89°15′24′′W in the Shawnee National Forest just south of Carbondale, Illinois, will be the first total solar eclipse visible from the southeastern United States since the solar eclipse of March 7, 1970. Click Here to View the NASA Interactive Google Map. Calculate Your Local Circumstance. Find Out How Close You are to the Path of Totality!! Where do you want to be?? Create your own custom eclipse glasses at Rainbow Symphony and get ready for 2017’s most exciting event!